The process of opening account through online is as simple as A-B-C. All Retail Individuals who have active Aadhaar linked mobile number or email id for one-time password verification can open account through the online portal. 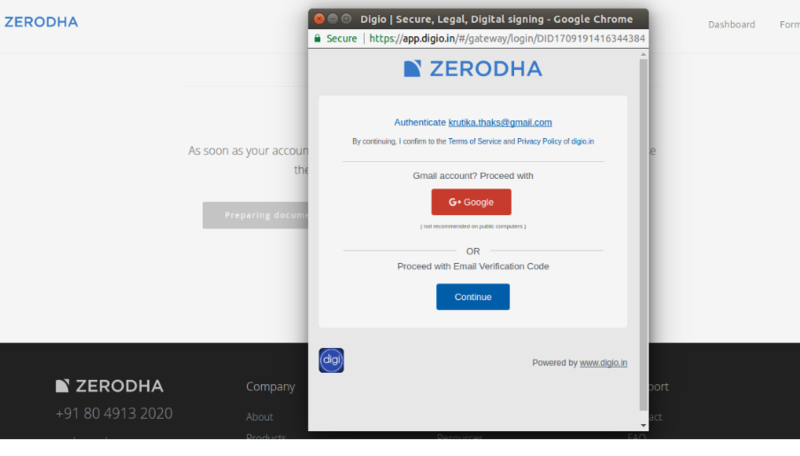 Click on the link https://zerodha.com/open-account. Enter your Aadhar number and OTP will be sent to Aadhaar linked mobile number to fetch data from UIDAI database, with customer’s consent. Click on E-Sign, Digio Screen will pop up for E-Signing.create an account using your Google account or your email. Click on sign and input your OTP which will be sent to you on your mobile. 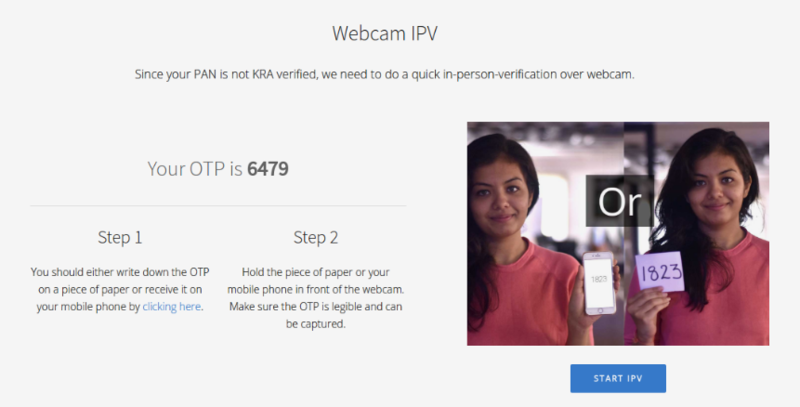 The last step, you should allow usage of the webcam to click a picture of the valid photo for real-time IPV. That's is it. The account will now be opened and you will be able to see the client ID on the top of the screen. If you don't have Aadhar or Aadhaar linked mobile number or email id for one-time password verification then you have to open the account through Off-line Process. Enter your Name, Mobile and Email. Zerodha salesperson will contact by phone or through the mail for assisting further processes. Take application form printout and need to courier the forms to Zerodha branch office (Banglore) or can drop forms at nearer Zerodha branch/Partner office. Is an IPV required if a person is KYC compliant? If a person has an account with a different broker or if he has invested in mutual funds he will already be KYC compliant, so an IPV is not required. What if there is a name mismatch between the PAN and Aadhaar of a KYC compliant person? Whenever a person is signing using Aadhaar, an Aadhaar KYC will also be done in the background. 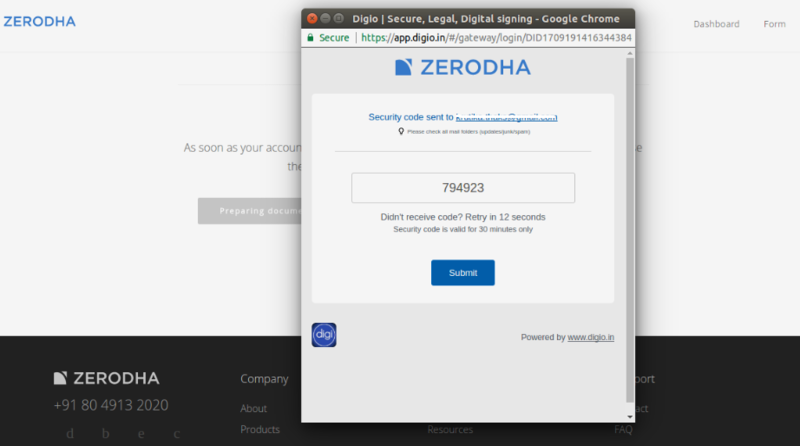 So Zerodha will be able to see the photo of the person who is signing which can be compared with the KYC photo. This will ensure that a mismatch doesn’t happen. Can a joint demat account be opened if both the holders/signatories are KYC verified? At present any account that will have two signatories even if they are Aadhar verified cannot open an account using Aadhaar signatures.They will have to follow the offline account opening process. Can an NRIs open account using Aadhar? No, they cannot. They will have to follow the offline process i.e PIS. Can an existing client with an equity account open a commodity account using Aadhaar and vice versa? 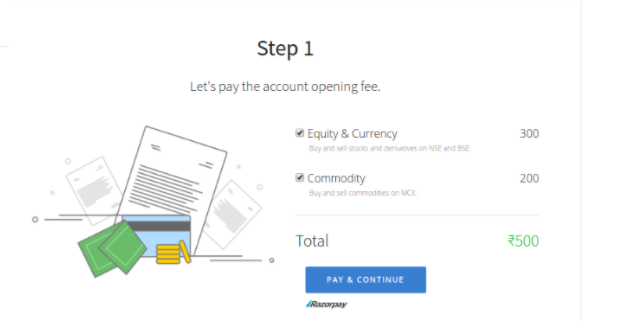 What if a client has already paid the account opening fee? He will have to pay the fee once again and he will get a refund once the account is opened. If the client ID is generated instantly, from when will a client be able to trade? He can start trading in 6-8 hours.